Jeff and I returned home to the Mendocino Coast from our Spring Run-Off Tour to find plenty of whitewater at home on the Mendocino Coast. This weekend we had a foursome of novice (some even first timers) come out to play with us on our first Whitewater of the Sea Adventure of our spring/summer season. 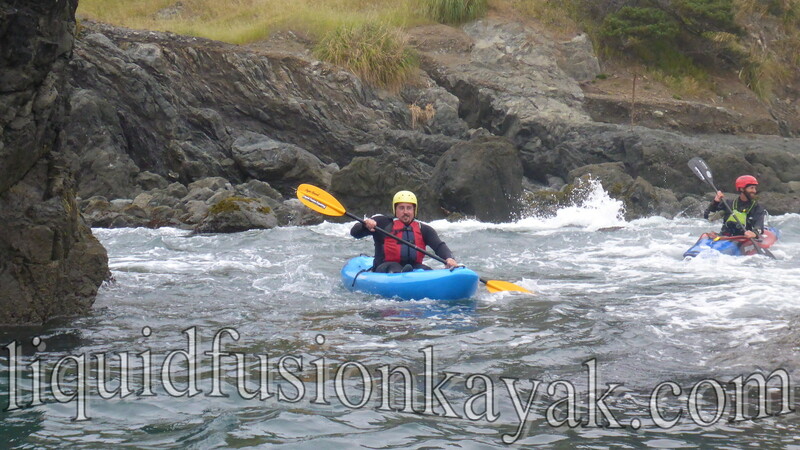 Whitewater of the Sea is whitewater kayaking in the ocean. Also known as rock gardening or rock hopping, whitewater of the sea is a combination of whitewater kayaking and surf kayaking. It involves timing to work with the ocean's energy to ride features, surf waves, and traverse through rocky passages. 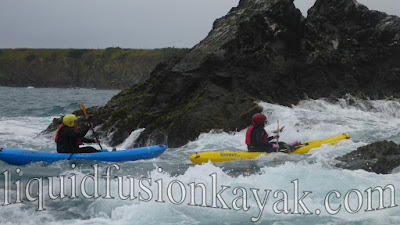 Waves, rocks, whitewater, and kayaking in Noyo Bay - Fort Bragg, California. We designed our Whitewater of the Sea Adventures to accommodate all skill levels. 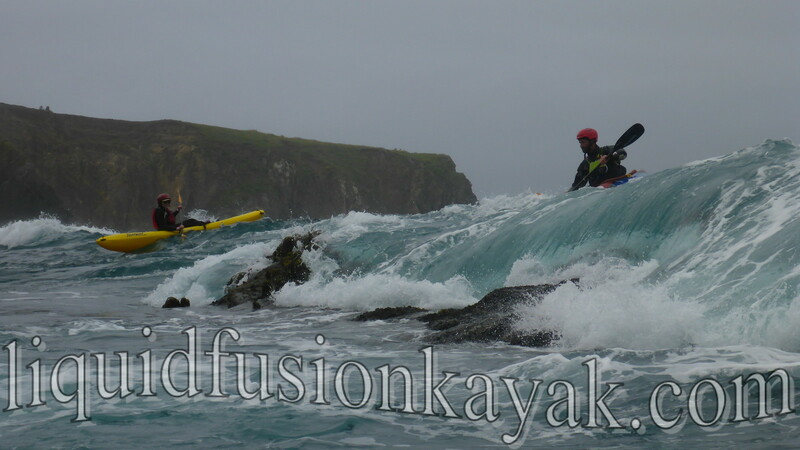 We have had beginners and expert kayakers out with us on the same trip. We run our Whitewater of the Sea Adventures on a Class II Level based on the international whitewater river classification system. Class II is low threat and high FUN. 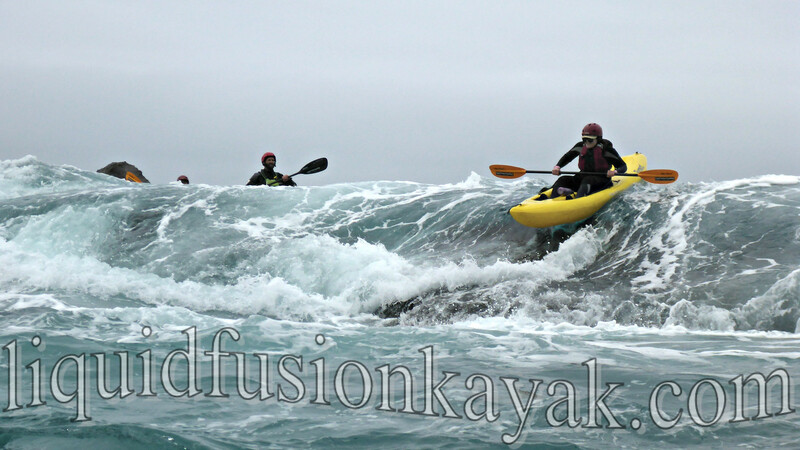 For more advanced paddlers, Class II is a great place to build skills and to get ready for our more advanced whitewater of the sea adventures including our Mendocino Whitewater Surf Safaris. For anyone who wants to kayak rocky coastlines like the Mendocino Coast, we highly recommend our whitewater of the sea adventure as a fun way to learn how to read the water, swells, and currents in and around the rocks. 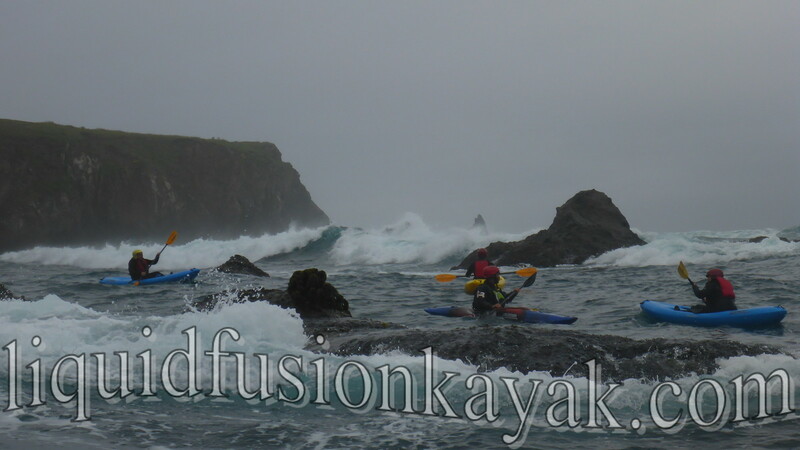 Kayaking among the rock gardens of the Mendocino Coast. We use whitewater kayaks for whitewater of the sea because of their maneuverability. Our goal for the trip is not to go far or fast but to have the most FUN. 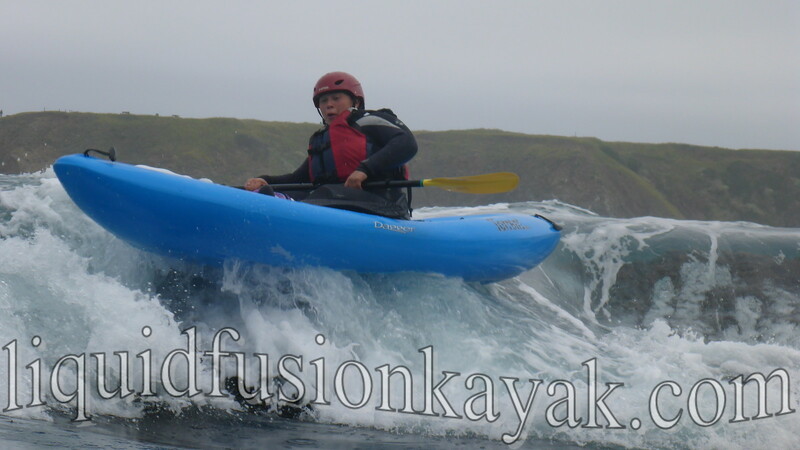 Whitewater kayaks in the 8-10 foot range have the speed to surf waves and get us where we want to go but also the maneuverability for tight passages through rock gardens and into tunnels and sea caves. Experienced kayakers who have a reliable roll may use a decked whitewater kayak for the class. For those without a reliable roll, we have a fleet of whitewater specific sit on top kayaks that are user friendly and fun. The Noyo Bay in Fort Bragg, California is an awesome playground. We have counted over 30 different play features in the bay. We have lots of options for play depending upon ocean conditions. Rock Gardening is kayaking a rocky coastline - waves add to the fun. We usually run our Whitewater of the Sea Adventures 3-4 times per week May through September 1. If you are looking for a fun adventure for your family and friends or a way to build your ocean kayaking or whitewater kayaking skills, definitely give us a ring and let us share our playground with you.